Rehearsal Log: Week 2 — A.B.L.E. Week two was full of swordfights, storytelling, and lots of fun! As always, we got started with a dance party and warm ups and then were ready for check in. Check in is an important time for us to get to know each other better, but also to think critically about the show we're creating. Act 1 of Cyrano de Bergerac ends with Cyrano running off to fight 100 men to protect his friend, Ligniere. This week for check in, we asked our ensemble “What would you fight to protect?” We heard some really interesting conversations. In the Friday ensemble, Sam would fight for his mom, Alena and Maria would fight for their sisters, Natalia would fight for her dog, and many of our actors would fight for love. Our Monday ensemble members were willing to fight for civil rights and justice. Ben, Hannah, and Emily K would fight for their families. And Anna would fight for the CUBS! You might remember, last semester, our ensembles were lucky to particpate in guest artist workshops with UK-based Frantic Assembly. We put some of the skills from these sessions to work this week. For our ensemble game, we played “Center”. Everyone moves around the room but has to keep their ears open for a variety of different directions. On “Go” we walk around the space. “Freeze’ you might guess means we freeze in place. “Center” means everyone runs into the center of the room and packs together as tight as possible. We also added some swordfight appropriate cues including “En Garde” and “Die” (the hams in our group loved staging big dramatic deaths!). This game is great fun and helps us build listening skills, reaction time, and physicality. We used all of these to move on to the next section of class: Devising. In addition to scenes and monologues, every A.B.L.E. show features a few group numbers that showcase the ensemble as one big team. For Cyrano, each ensemble will have a group song and a giant swordfight. This week we started choreographing these fight sequences. Working in partners, we developed short combinations that will serve as the basis for our fights. We’ll keep building on these in the weeks to come. 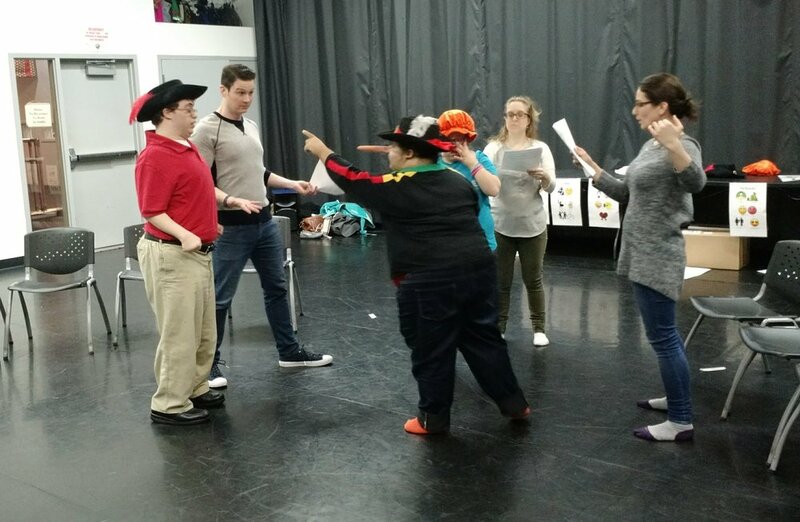 Our actors get experience playing multiple characters throughout the rehearsal process. 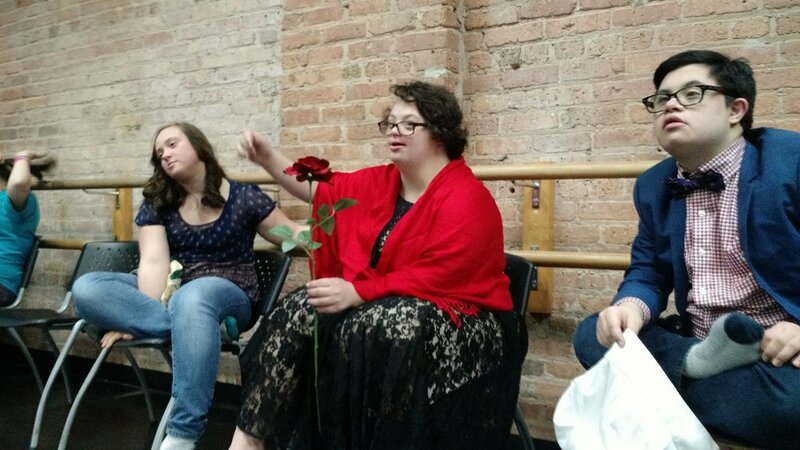 This Friday, Alena was our Cyrano, Sam P was Le Bret, and Mila played Ligniere. After a round of Musical Characters, we learned the story of Act I. Play plots are written like a storybook, with a few lines from each character popped in. One of our teaching artists reads the narration, and the rest of the ensemble works to act out what we hear. It helps us to learn and retain the story by acting it out rather than just listening to it our reading it to ourselves, and also gives everyone an opportunity to practice our dropping in skills. Over the next few weeks, we'll learn each act of the story by acting out these play plots, with each actor getting a chance to play several different characters. After check out and "I Take..." we headed home for the night! Next time: we'll continue with our play plots to learn Act II, and will also have a visit from guest artists Kendra and Peter to learn our ensemble songs! You can see us in action Thursday May 17th at 7pm at The Yard at Chicago Shakespeare Theater.